Whenever I step inside any branch of Watsons Store, I'm always in a eureka moment! It's one of my favorite stores in the metro because of best deals and great finds under one roof. I've been a Watsons shopper ever since, I can't recall when was the exact year that both of my feet landed inside their store here in Fairview but from then on, my trip to Sm Malls and other malls where there is Watsons will not be complete if I will not pay a visit at their store. So when I was invited to shop with one of Watsons brand ambassador last week, I immediately said yes without hesitation. I was so excited to shop with Ms. Tessa Prieto-Valdes because I've heard lots of great things about her. She's nice inside and out. Truth be told she's really nice and approachable in person :) Dressed in a Watsons Store personnel uniform, Ms. Tessa introduced me to Watsons Label. 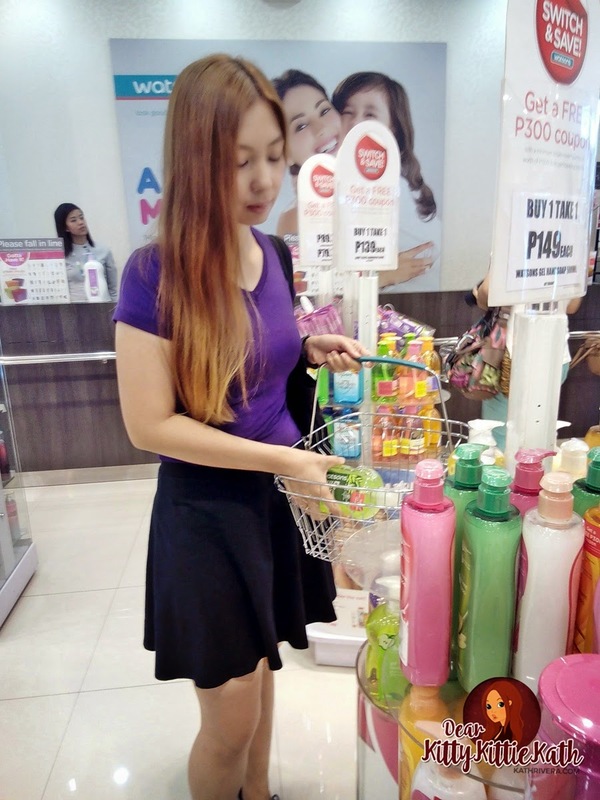 She's a smart shopper that's why she highly recommends Watsons Label to all the shoppers. More details about this fun shopping event with Tessa Prieto-Valdes after the jump! From personal care items, beauty essentials, and even medicine, Asia's leading personal care store now offers a wider variety of products under it's own label, giving shoppers the choice to save as much as 80 percent without compromising on quality. That's a big savings especially for a mother like me who wants to save money on everyday essentials. 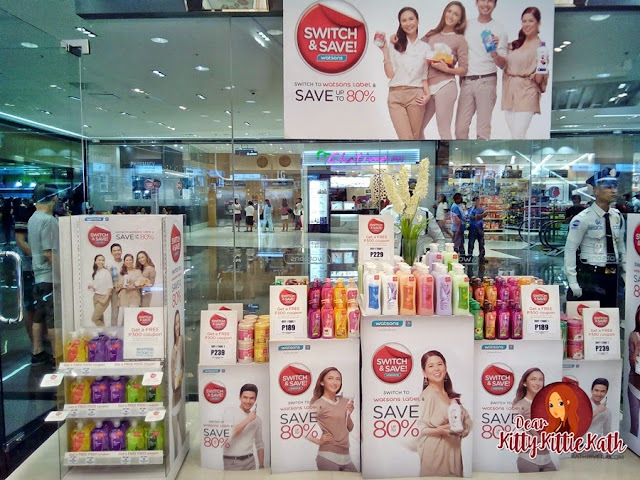 Watsons has irresistible deals that's why their campaign has caught the attention of several celebrities who made the Switch and Save including Tessa Prieto-Valdes, Patty Laurel, Iya Villana-Arellano and the newest switcher Christian Bautista. Since I'm a skin care junkie, the first products from the Watsons Label line that caught my attention was the hand soap, hand soaps! They offer a variety of hand soaps in a BOGO (Buy 1, Get 1) deal. It's amazing that they also have refills for each variant that's also in a buy 1 take 1 offer. I want to buy a pair from each variant, if you only knew me. I wash my hands more than 10 times a day at home. That's how OC I am, clean hands all the time! Tessa Prieto- Valdes shared her bath essentials which include Watsons Strawberry and Yoghurt Cream Hand soap that effectively cleanses and protects hands from dryness, Watsons Scented Cream Body Wash with Goat's Milk to gently slough off dead skin cells and helps to hydrate and brighten the skin and Watsons Whitening Milk and Salt Scrub to help enhance the skin, and exfoliate dead skin cells. Tessa was a very energetic and informative sales attendant that day so I was persuaded by her words to switch to Watsons Label Hand soaps. These hand soaps smell so good! Not bad for the price since a 500 ml of scented hand soap costs 74.50 php. For less than 150 php, you'll get 2 500 ml bottles of cream or gel variant. What's great about the offer is that you can also mix and match the variants from the hand soap line. I also found out that to keep her skin looking healthy and protect it from free radical damage, Tessa relies on a couple of products from Watsons Generics. Watsons Glutathione to lighten skin and prevent skin darkening caused by UV exposure and Watsons Vitamin E to prevent eye disorders and help her avoid a number of diseases. 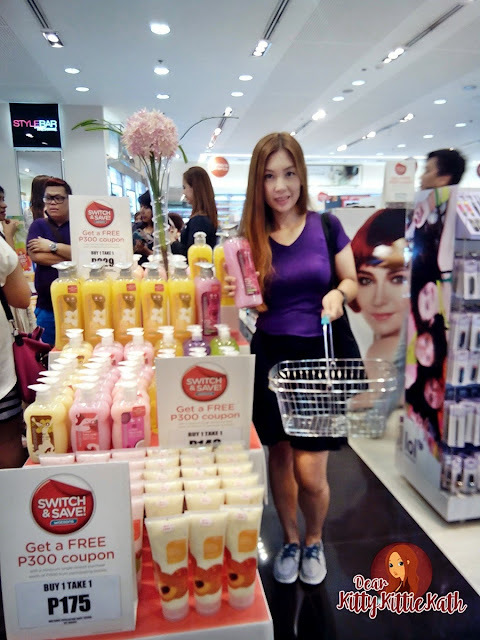 Tessa is the second Switch and Save Ambassador who made a surprise visit to a Watsons Store. 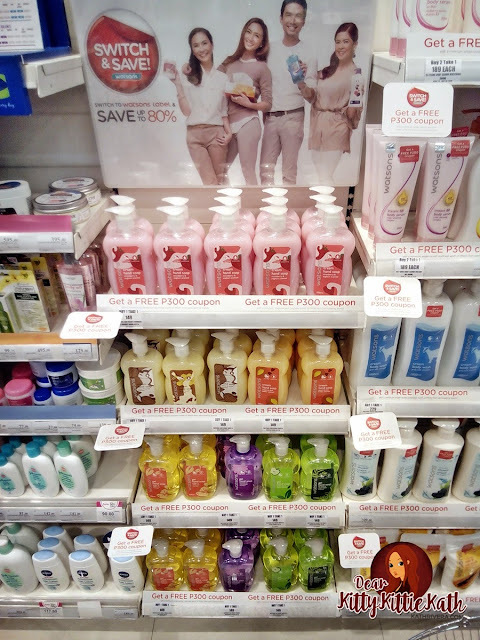 Watsons Label believes that with more value from hard-earned money spent on quality affordable products, every Filipino Gets more savings to enjoy other important things in life with their loved ones. To tell you honestly, I did not shop that day even if my hands were itching to place most of the Watsons Label products that was recommended by Tessa to me in my shopping basket. I have kept in my mind all the things she rave and the personal care products that she's truly using. So when I got home, I listed them down and last weekend I went to Watson's Fairview Terraces branch to shop, Switch and Save with Watsons Label products. The photo above shows my haul. I've included other brands that I'm already using here. They have great deals with other brands so I also bought them. Anyhoo, I'm so happy with my hauls! Total shopping damage spent was 2,000 php. I just forgot to include the hand soaps in this photo. I've hoarded and shared them with my sisters and in-laws. I've bought 6 bottles in different variants and 2 hand soap refills. Here are the Watsons Label products that I bought which gave me a big savings! As per Tessa's advice, the Watson's Generics Vitamin E prevents eye disorder and other disease so I need to have a box! I've also included Watsons Generics Vitamin C, Watsons Invigorating Wet Tissue in Green Tea scent which is their best-seller, Watsons Loofah Pad, Watsons Milk and Salt Scrub, also a fave of Tessa but my pick was the collagen variant. Watson's Argan Oil shampoo because I'm a sucker for anything natural and Watsons Psyllium Fiber out of curiosity because it's calamansi flavor. Drop by any Watsons stores now and enjoy more saving with the "Shop to Save" promo. Get a 300 coupon with a minimum single-purchase receipt of 1,500 php from the participating Watsons Label products and exclusive participating brands. Promo will run until May 20, 2015. I was not able to qualify for this promo but I'm happy that I got a pretty orange pouch FREEBIE!